Lynne Twist is a co-founder of The Pachamama Alliance, and founder of The Soul of Money Institute. She has dedicated herself to alleviating poverty and hunger, and supporting social justice and environmental sustainability. In 1995, a group of people, including John Perkins, and Bill and Lynne Twist, answered a call from the Amazon rainforest and Mother Earth herself. At the invitation of leaders of the Achuar indigenous people of Ecuador, they traveled to their Amazon home to learn more about this imminent call their hearts yearned for an answer. The Achuar shared with them the urgent threat to their lands and culture, their vision for self-determination, and a request for allies from the North who would “change the dream of the modern world” by shifting its culture of over-consumption to a culture that honors and sustains life. This group committed to a partnership with the Achuar, and, upon their return to the United States, co-founded The Pachamama Alliance to carry this commitment out. 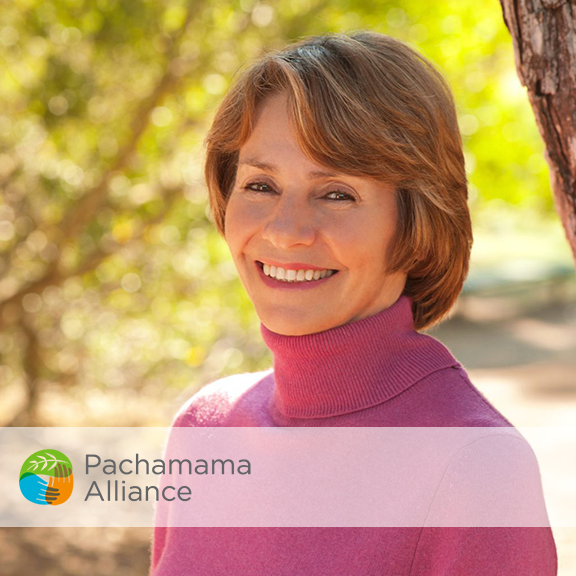 To date, Lynne is a Pachamama Alliance board member and fundraiser. She also leads journeys into the Amazon rainforest through the organization’s Pachamama Journeys program. From working with Mother Teresa in Calcutta to the refugee camps in Ethiopia and the threatened rainforests of the Amazon, Lynne’s on-the-ground work has brought her a deep understanding of the social tapestry of the world and the historical landscape of the times we are living in. Her 40+ years of global work are testament to her commitment to alleviating poverty and hunger and supporting social justice and environmental sustainability. Her journey has led to features in over 10 films, including: “The Shift” (Michael Goorjian, 2010), “Crude Impact” (James Jandak Wood, 2006) and “Women of Wisdom and Power” (Lili Fournier, 2000) and “Money & Life” (Katie Teague). In addition, she has been interviewed by dozens of media outlets including The Huffington Post, “Mehmet Oz Radio,” Oprah and Friends Radio, NPR, The Chicago Tribune, The San Francisco Chronicle and PBS. A sought-after speaker, Lynne travels the world giving keynote presentations and workshops for conferences including: United Nations Beijing Women’s Conference, Nobel Women’s Conference on Sexual Violence, State of the World Forum Conference, Alliance for a New Humanity Conference with Deepak Chopra, Synthesis Dialogues with His Holiness the Dalai Lama and the Governor’s Conference on California Women, among others. In addition, she has co-presented and shared the stage with some of today’s most influential thought leaders including: Angeles Arrien, Marianne Williamson, His Holiness the Dalai Lama, F.W. de Klerk, Stephen Covey, Riane Eisler, Deepak Chopra, Barbara Marx Hubbard, Jane Goodall, Jean Houston, Roshi Joan Halifax and Archbishop Desmond Tutu. In 2003, Lynne founded The Soul of Money Institute. The Institute is a center for exploring and sharing the best practices, theories, and attitudes that enable people to relate to money and the money culture with greater freedom, power, and effectiveness. Lynne’s book, The Soul of Money, is a wise and inspiring exploration of the connection between money and leading a fulfilling life. This compelling and fundamentally liberating book shows us that examining our attitudes toward money– how we earn it, spend it, invest it, and give it away–can offer surprising insight into our lives, our values and the essence of prosperity. Through moving stories and practical principles, Lynne demonstrates how we can replace feelings of scarcity and guilt with experiences of sufficiency and freedom. In this book and its audio CD workshop, “Unleashing the Soul of Money,” Lynne shares from her own life and work a journey illuminated by remarkable encounters with the richest and poorest people on earth, from the famous (Mother Teresa and the Dalai Lama) to the anonymous but unforgettable heroes of everyday life. She has also written numerous articles for RSF Quarterly, Fetzer Institute, Noetic Sciences Quarterly, and YES! Magazine, among others. Prosperity flows from sufficiency — the recognition of enough. Our legacy is what we live – not what we leave. Through The Soul of Money Institute, Lynne has worked with over 100,000 people in 50 countries in board retreats, workshops, keynote presentations and one-on-one coaching in the arenas of fundraising with integrity, conscious philanthropy, strategic visioning and having a healthy relationship with money, when you make it, spend it, donate it or invest it. Lynne’s Soul of Money Institute clients cover a wide variety of profit, social profit (nonprofit) and educational institutions including: Nobel Women’s Initiative, Microsoft, Procter & Gamble, Charles Schwab, United Way, The Red Cross, Amnesty International, Sierra Club, Women Presidents’ Organization, Young Presidents’ Organization, Entrepreneurs’ Organization, Environmental Protection Agency (EPA), The Stanford Business School, MIT Sloan School of Management and Harvard University.